The Genesis Slide-in Widget creates a slide-in panel, to quickly show side content, navigation, contact form, notifications or profile information. 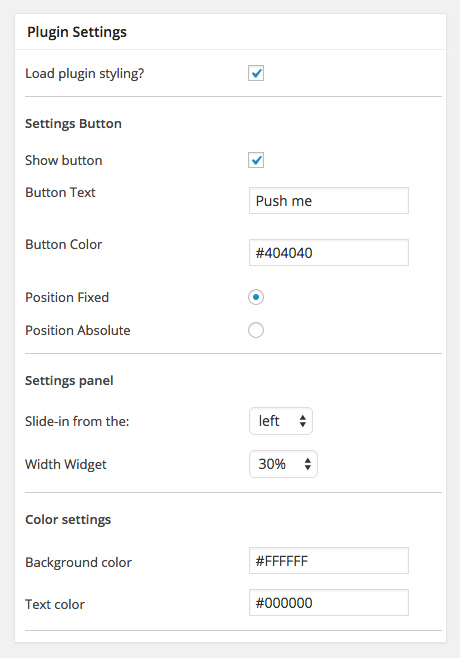 Set background-color, button position and choose the width of the panel. Navigate to Appearance > Widgets. In the right column you see a new widget area with the name Slide-in Widget. Add a widget of your choice, for example a custom menu or text widget. If you don’t set a widget there is nothing to show! When the widget is set and saved go to the frontpage and see the result. Uncheck this option if you don’t want to show the trigger button. Instead you can use the shortcode to fire the slide-in widget. Set the position of the button fixed or absolute. Slide the widget panel in from the left or right. Set the width of the widget panel. You can choose, 10%, 20%, 30%, 40%, 50% and 100%. Set the background color of the widget slide in panel. The background color can be set in rgba or hex. The text color is only set on text not on links. If you like to fire the Slide-in widget not only from the activation button you can use the short-code. With the short-code you can place the trigger in the content of your posts, pages, or widgets. The short-code above creates a activation link with the text “Activate the Slide in widget”. Change this text to your own, and that is it!